Don’t stop behind the first house … keep driving down the dirt road until you see The Store and parking area! Commerce: Take Hwy 441 South to Nicholson. After the traffic light, go 0.7 miles to Old Kings Bridge Road and turn right. Go approximately 2.3 miles, and we are on your left. Jefferson: Take Hwy 129 through Arcade. After Redstone Methodist Church, turn left on New Kings Bridge Road and go 3 miles. Turn left on Old Kings Bridge Road. We are ½ mile on the right. Athens: From the Athens bypass (Loop 10), take the Hwy 441/Commerce exit and travel North. After crossing the Jackson County line (near J & J Flea Market), travel 3.2 miles. Turn left onto Shilo Road (just after crossing the bridge). At the stop sign, turn right onto New Kings Bridge Road. Travel approximately 2 miles to Old Kings Bridge Road and turn right. 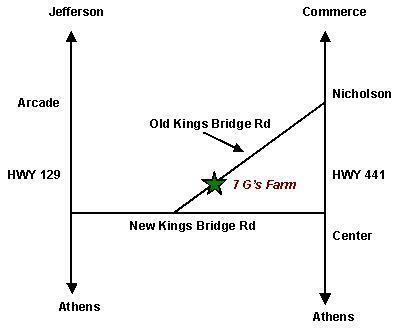 We are ½ mile on the right at 2331 Old Kings Bridge Road. Atlanta: Take I-85 North to Exit 137 Jefferson. Exit right onto Hwy 129 and go 11.3 miles. Turn left on New Kings Bridge Road and go 3 miles. Turn left on Old Kings Bridge Road. We are ½ mile on the right.